Saviour 1 Seater Sofa in Mocha Brown offers ergonomically designed sofa with fabric and PVC, which consists of a solid wood frame that ensures the provision of sturdiness to the sofa. Its webbing on seat and wide armrest provides maximum comfort while seating. 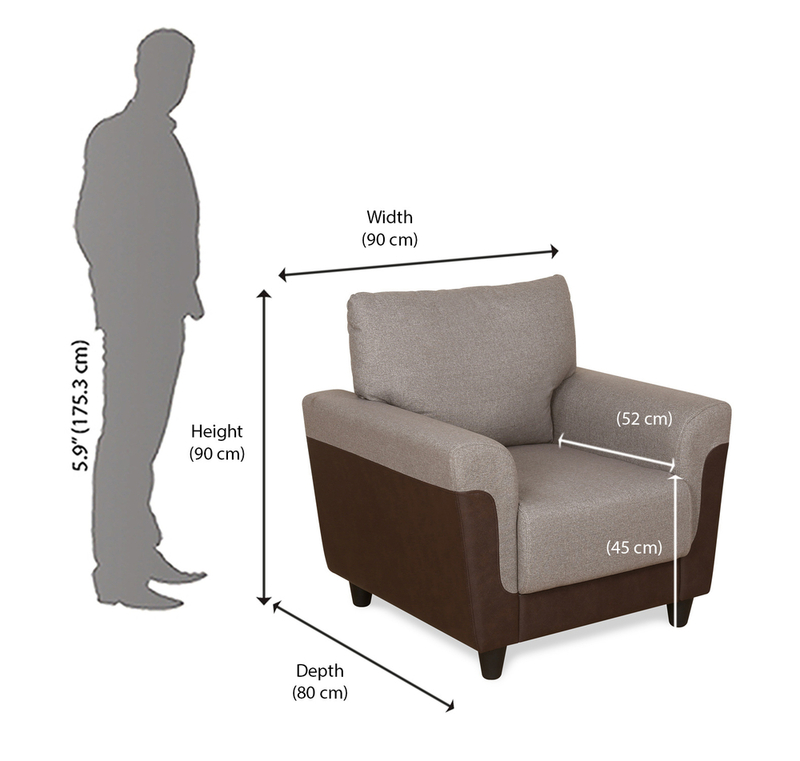 This sofa consists of a solid wood frame and a foam density of 32 kg/m3. With a 3-inch webbing construction and upholstery constructed from PVC and chenille, this sofa displays a classy look. The back frame is constructed of engineered wood and Recron which ensures that the backbone is not under too much stress. Its cushiony and wide arm rest contributes to maximum comfort and gives a sophisticated look to your sofa. The Saviour 1 seater sofa complies with the BIFMA certification which proves that it is a quality and assured product available in the market. Saviour 1 Seater Sofa is perfect for adding that glam and classy look to your living room. This piece of furniture completely blends with the others and stands out. It is quite medium weighted and proves easy to move it around. So style your home with the amazing Saviour 1 Seater Sofa @Home. Ergonomically designed sofa with fabric & PVC.Solid Wood frame gives sturdiness to the sofa.Webbing on seat & wide armrest provides comfort while seating.